The socially ambitious wife (Bette Davis) of a country doctor (Joseph Cotten) longs to escape to Chicago to be with her wealthy lover (David Brian). 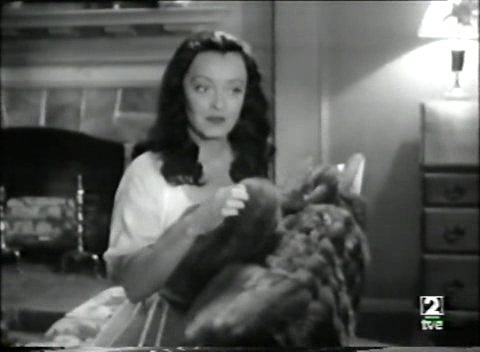 Labeled by one reviewer as “King Vidor’s most demented film from his most frenzied period”, this steamy backwoods melodrama — starring a too-old Bette Davis “done up for all the world like Jennifer Jones”, in black wig and red lipstick — has achieved near camp-classic status in recent years. Davis’s personal scorn for this film — her last while under contract for Warner Brothers — serves her character well, as her “Rosa Moline” desperately claws at every opportunity to leave her staid life and boringly decent husband behind her. Oddly enough, we can’t help feeling sorry for this pathetically unhappy creature, who’d be the ultimate femme fatale, if only she weren’t screwing up her own life rather than her man’s. Note: Beyond the Forest is best known by many these days for featuring the now-classic line, “What a dump” (listed as number 62 on AFI’s 100 Greatest Movie Quotes). No, but Davis fans will certainly want to check it out. ‘Demented’? Oh, I don’t know…certainly director Vidor’s ‘Duel in the Sun’ and ‘Ruby Gentry’ run more along demented lines (though that’s probably thanks in each case to Jennifer Jones). I’ve just seen ‘BTF’ (twice) after many years and – well, I’m in love all over again! This is my theory of one main reason why Davis did not want to do this movie: her character is completely unsympathetic. We don’t feel sorry for her at all (and I would guess Davis was very aware of that and did not take to the idea of audiences turning on ‘her’). All Rosa cares about is Rosa – she as much as says so. So all we can really do is watch as she gets what’s coming to her. *She* may think her husband is boring, but we don’t; he is portrayed as a very kind, giving doctor who goes way beyond the call of duty. It’s almost impossible to imagine what brought these two people together in the first place (…except Rosa at least knew she would have the best home in town). Davis was too old for the role. But, even though she did not even want to accept the role, she plays Rosa with every typical ounce of conviction, and she makes us buy it! She doesn’t just portray Rosa – she rips into her (while being ably supported by that dashing force of nature, David Brian). And, as is usual with Davis, you can’t stop watching her. You will probably not be prepared for what follows once Rosa becomes ill. This whole last section of the film may be what has tempted critics to disregard the film as ‘demented’. But, if you’re asking me, it fits right in with everything that preceded; it’s the most logical conclusion for the tragedy of Rosa’s entire life. By the way…lovers of juicy dialogue, climb on board: there’s a big whole heap of it right here! WHY IS THIS LEFT OUT? BTF IS ADAPTED FROM “MADAME BOVARY.” NOW THAT I’VE TOLD YOU, YOU’LL REALIZE THIS WHEN YOU VIEW IT AGAIN. Thanks for the heads up! That certainly does put a different spin on the entire story.